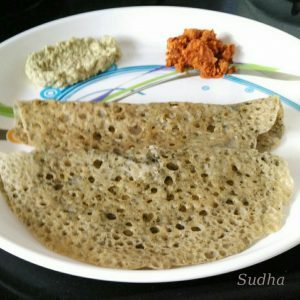 Ghavan is an easy, quick, tasty and healthy option for Breakfast / snack from Konkan. I’m giving 7 variations of Ghavan in this article. 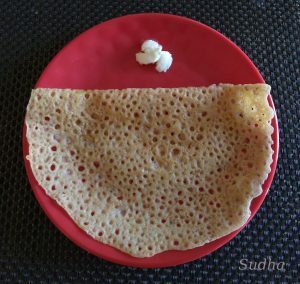 Ghavan is a specialty of Konkan – coastal Maharashtra. Main ingredient in this is Rice Flour. You can mix different things with it. The batter should be watery. Flat Griddle should be steaming hot. Pour the batter from little distance on hot griddle and move the pouring bowl in circular fashion while pouring the batter so that batter evenly spreads thin on the griddle. This makes nice, soft Ghavan with a mesh design on it. If you get Mesh design on Ghavan, it is perfect Ghavan. If you miss any step in this process, Ghavan will not be perfect. For new cooks, it will take some practice to master this process. After pouring batter on the griddle, reduce the flame to medium. Cover and cook for 2 minutes. Remove the lid and check. If you can see wet batter on the top, cook it further. Else spread a few drops of oil / butter / Ghee on the Ghavan and flip it. Cook the other side without covering it. Ghavan is served along with white butter or Clarified Butter or Chutney or Cooked Pulses (उसळ). Malvani Ghavane (मालवणी घावणे) that are served in restaurants are very thick. 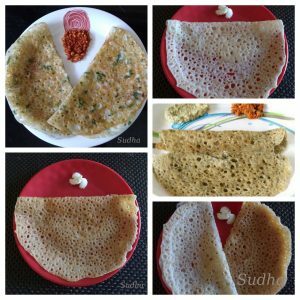 Traditional Ghavan are thin and soft. 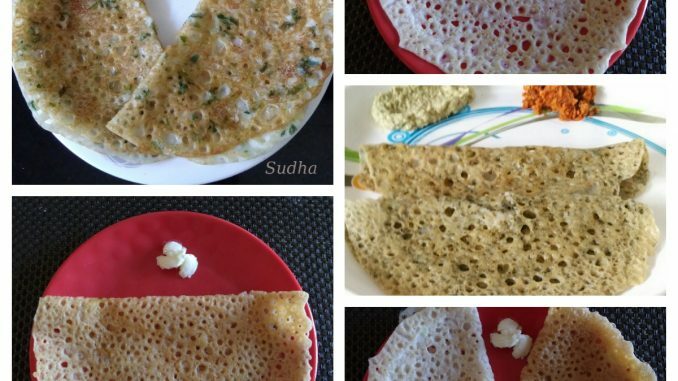 South Indian Neer Dosa (नीर डोसा) is somewhat like Ghavan. But that is made after grinding soaked Rice. Fresh scrapped coconut is added while grinding. 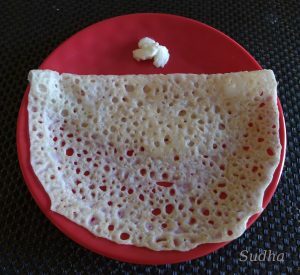 And Neer Dosa is cooked only from one side. In a bowl, Mix 6 tablespoon of Rice Flour, Salt and water to make batter of watery consistency. Make Ghavan as per instructions given above. Chop 6-7 Garlic cloves into small pieces and add it to Basic Ghavan Batter. Rest of the process like Basic Ghavan. Finely chop 1 medium size onion and mix with Basic Ghavan batter. est of the process like Basic Ghavan. Add ½ cup finely chopped coriander and ½ teaspoon crushed green chilly in the batter of Garlic Ghavan. Rest of the process like Garlic Ghavan. Add ½ cup finely chopped Fenugreek leaves and ½ teaspoon crushed green chilly in the batter of Garlic Ghavan. Optionally you can add ½ cup of buttermilk while mixing the batter. Rest of the process like Garlic Ghavan. This is my innovative fusion recipe. Add 2 tablespoon of crushed roasted dry Fenugreek leaves (kasuri methi) in the batter of Garlic Ghavan. Optionally you can add ½ cup of buttermilk while mixing the batter. Rest of the process like Garlic Ghavan. This is my innovative fusion recipe. Add 1 tablespoon of Piri Piri Powder in the batter of Garlic Ghavan. Rest of the process like Garlic Ghavan. ब्रेकफास्ट साठी अतिशय उपयुक्त असे झटपट बनणारे, चविष्ट आणि पौष्टिक वेगवेगळ्या ७ प्रकारचे घावन. घावन हा कोकणातला पदार्थ आहे. ह्यात मुख्यतः तांदुळाचं पीठ असतं. त्याच्याबरोबर तुम्ही काहीही घालू शकता. घावनाचे पीठ अगदी पातळ भिजवायचं रवा डोश्यासारखं. आणि सपाट तवा खूप गरम करून काठ असलेल्या भांड्याने जरा उंचावरून हे पीठ गरम तव्यावर ओतायचे. पीठ ओतताना भांडे गोल फिरवायचं म्हणजे छान पातळ आणि जाळीदार घावन बनतात. ह्या कृतीत एक जरी त्रुटी राहिली तर परफेक्ट घावन बनणार नाहीत. नवशिक्या माणसाला जरा प्रॅक्टिस करावी लागेल. पीठ तव्यावर घातल्यावर गॅस मध्यम करा. झाकण ठेवून घावन भाजा. २ मिनिटांनी झाकण काढून चेक करा. जर घावनावर ओलं पीठ दिसत असेल तर अजून थोडा वेळ झाकण ठेवून भाजा. नाहीतर घावनावर २ थेम्ब तेल/तूप पसरवा आणि घावन परता. आता झाकण न ठेवता भाजा. घावन लोणी, साजूक तूप, चटणी किंवा उसळी बरोबर खातात. हॉटेल मध्ये जे मालवणी घावणे म्हणून विकतात ते फार जाड बनवतात. पारंपारिक घावन पातळ आणि लुसलुशीत असतात. 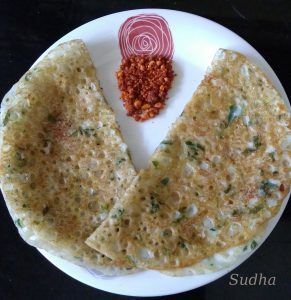 दक्षिणेतला नीर डोसा थोडासा असा असतो. पण त्यात तांदूळ भिजवून वाटतात आणि वाटताना ओला नारळ घालतात. आणि नीर डोसा एकाच बाजूने भाजतात. ६ टेबलस्पून तांदुळाचे पीठ घेऊन त्यात मीठ, जिरं आणि पाणी घाला. आवडत असेल तर थोडे ताक घाला. पीठ अगदी पातळ भिजवून वर सांगितल्याप्रमाणे घावन घाला. बेसिक घावनामध्ये ७–८ लसणीच्या पाकळ्या बारीक चिरून घाला. बाकी सर्व बेसिक घावनाप्रमाणे. बेसिक घावनामध्ये १ मध्यम कांदा बारीक चिरून घाला. बाकी सर्व बेसिक घावनाप्रमाणे. लसूण घावनामध्ये अर्धा कप कोथिंबीर बारीक चिरून घाला. अर्धा चमचा हिरव्या मिरचीची पेस्ट घाला. बाकी सर्व बेसिक घावनाप्रमाणे. लसूण घावनामध्ये अर्धा कप मेथीची पानं बारीक चिरून घाला. अर्धा चमचा हिरव्या मिरचीची पेस्ट घाला. आवडत असेल तर पीठ भिजवताना अर्धा कप ताक घाला. बाकी सर्व बेसिक घावनाप्रमाणे. ही माझी इनोवेटिव्ह फ्युजन रेसिपी आहे. लसूण घावनामध्ये २ टेबलस्पून गरम केलेली कसुरी मेथी चुरा करून घाला. आवडत असेल तर पीठ भिजवताना अर्धा कप ताक घाला. बाकी सर्व बेसिक घावनाप्रमाणे. ही माझी इनोवेटिव्ह फ्युजन रेसिपी आहे. लसूण घावनामध्ये १ टेबलस्पून पिरी पिरी पावडर घाला. बाकी सर्व बेसिक घावनाप्रमाणे. Loved ur traditional recipe very much. Looking forward to more such! Thanks. Thank you for your message Vandana.